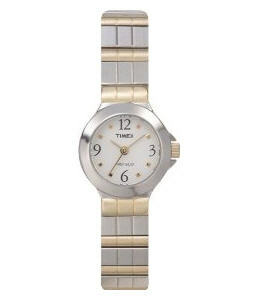 Glamorously chic and nicely affordable, this two-tone Timex stainless steel women's watch (model 2K511) is an excellent choice for dressier occasions. One of the world's smallest Indiglo night light watches, it features a circular watch case with a flattened silver bezel and highly polished sheen. It frames a milky white dial background that's accented by a mix of black Arabic numeral and gold-tone dotted markers and tiny golden baton hands (with seconds hand). It's completed by a comfortable expansion bracelet that mixes silver and gold tones, and is integrated into the case design. It also features a scratch-resistant mineral crystal, protected gold-tone crown, and water resistance to 30 meters (99 feet).